Although emptying your sales pipeline sounds counterintuitive, it’s necessary for most of us. When I say “empty your pipeline,” what I’m really talking about is being choosy about whom you keep in and when it’s time to clean house. There’s such a thing as too big. When it comes to your sales pipeline, you must be careful about not letting it get overstuffed with prospects. Think of it this way: If your goal is to have 20 deals in your pipeline at any given time, and you have 50, this seems like a good thing, doesn’t it? After all, with so many deals in the various stages of your pipeline, you’re ahead of the game. The reality is that this may not always be the case. Too many deals spread your available resources too thin. You tend not to pay the proper amount of attention to all the deals in the pipeline and some can grow cold and stale. In my pre-Pipedrive days we once hired a salesman who had really distinguished himself before signing on with us. Strangely, it didn’t take very long before we realized he was having some challenges. In one month, he began with 10 really great leads, but by the end of the month most hadn’t moved along the pipeline. It took us awhile before we both had come to the conclusion that the old “we’re still thinking about it and we should have a definite decision in a couple of weeks” response wasn’t good enough. We had heard it too many times. He quickly learned his lesson and became one of the best closers on the sales team. Ask yourself: Would a customer laugh at the idea of being in your pipeline? If they don’t take you seriously, don’t take them seriously. Ask your prospects if it’s possible if they will make a decision this month. If the answer is no, it’s time to move on. When someone says that they would like your product or service, but not this month/quarter/year, it may not seem like a lost cause, but it is. You must consider them for flushing because there’s nothing you can do to close them within the constraints of your sales cycle, or even the near future. Go through all of the contacts in your sales pipeline once a week, or every two weeks. If you find a prospect who’s been sitting in the pipe and clogging it up for longer than your typical sales cycle, and doesn’t show any signs of moving to the next stage soon, flush them. Don’t get rid of them entirely. Put these flushed prospects into a future pipeline or a future callback list. If you’re using sales management software such as Pipedrive, schedule a follow-up call or email. Stay focused on deals that have a strong chance of closing during your established sales cycle. If you’re a Pipedrive customer, start using our deal rotting feature. Flushing prospects out of your sales pipeline will feel a bit strange. It’s hard to put aside a potential customer, even a lukewarm one. But the whole thrust of this course is to keep your focus on the strong candidates and to keep them moving along the stages of your pipeline. Proper focus, good work habits and continuous effort create a steady flow of revenue through your pipeline. If you're not convinced yet about emptying your pipeline, see how other countries have experienced sales performance success by doing just that. P.S. If you liked this post, check out Sales Pipeline Academy. We’ve distilled our sales management experience into 11 actionable emails over 25 days. It’s not bedtime reading, and there is some homework involved, but the feedback has been great, so check it out. 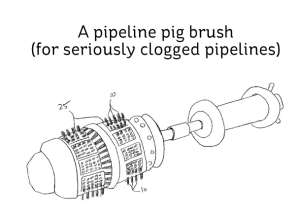 Illustration courtesy: patent for Method of making a pipeline pig brush and brush assembly. 15+years of sales pipeline know-how condensed into 1 email course. How to Avoid the Trap of "Making Sales People Busy"?